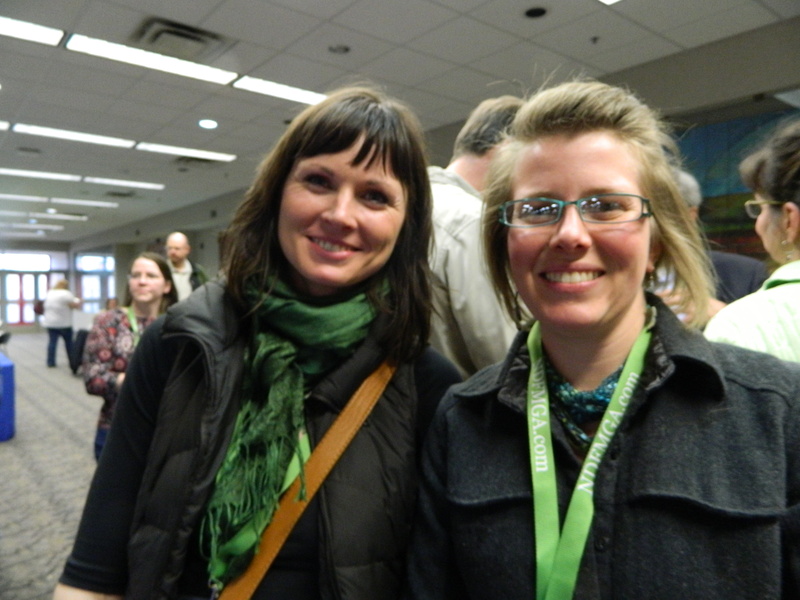 My mind is still processing so much from my experience at the 2013 Dakota Grown Farmers Market & Local Foods Conference that I attended on Friday April 11 in Bismarck. While the topics were interesting, I benefited most from the opportunity for networking. I saw so many wonderful friends and met amazing people doing admirable and ambitious work. I heard their stories. I shared mine. And while I tried to do some live real-time blogging from the event, I found that I couldn’t very well function as a fly on the wall with the purpose of relaying what I heard in the sessions. I’m not a reporter, I’m a storyteller. And while I’m not very good at making up stories (even for my kids), I do have a knack for picking up on interesting patterns through social connections. I can interpret and present those complex relationships in thought provoking ways. In fact, the whole reason I started this blog in November 2012 was to share a story– my story of recovery and growth. But my story is never just mine alone. There are many characters involved. Characters who have been influential in my process of creating myself as an independent entrepreneur with specialized knowledge related to sustainable agriculture, environmental education, and community development as well as skills in art and writing. It took a lot for me to get to this point, as it does for anyone trying to find their niche. The past year has been a dynamic one for me. I could certainly share the details of losing a parent, becoming aware of my own unhealthy patterns, and resigning from my position in college-level administration, but really the exciting parts began when I made the choice to lead my life with consciousness. I wanted to live my life through my passions– food, art, nature. I wanted to grow and flourish each day. After leaving my job, I took several months off and focused on working on myself and my health. Each morning, my boys and I would go outside, let the chickens out, and work in the garden. I worked on living in the moment, appreciating each and everyone. I worked on nourishing myself by putting energy into the things that would most greatly benefit me and my family. 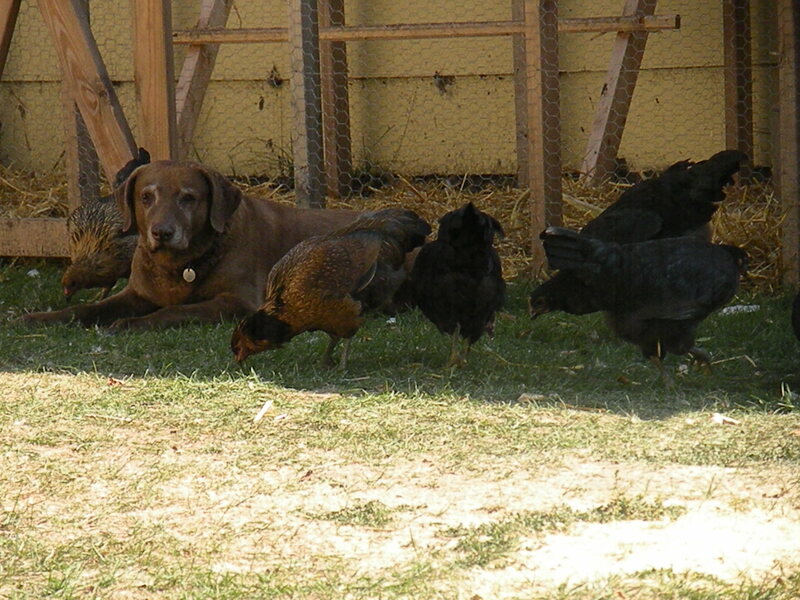 I learned to accept and be still, just like our retired hunting dog did when we got chickens. As I got stronger, I wanted to share my passion with others in the world. But I was still new in town. I didn’t know many others that understood the amazing experiences I had while observing the flock, collecting eggs, harvesting eggplants, or pickling cucumbers. Finally, I got brave. I made up batches of yellow tomato jam, apple butter, and jalapeno jelly. I harvested fresh herbs and sunflowers, then wrapped them and priced them. I went to the Sheyenne Farmers Market as a vendor. Sheyenne is a tiny little town, north of where I live in New Rockford. The other vendors there included a older couple who sold their surplus of produce, melons, and the most amazing raspberries, two teenage sisters selling the bounty from their garden and the baked goods of their kitchen, one woman selling farm fresh eggs, and another selling cookies and jams. I was surprised to find I fit! I was welcomed and considered a part of the group. We had a wonderful time and made a good number of sales. I was hooked. Next year, I will plan on being a vendor there, every week I can. This acceptance I received at the Sheyenne Farmers Market gave me the courage to make the next steps- to start building my connections and marketing my skills in grant writing and consulting. I was slowly getting my energy back. I was healing from intense grief. I was recovering from exhaustion and burn-out. I was getting back on my feet. I built a relationship with the local librarian and started going to the monthly bookclubs. Again too, I was welcomed and accepted, even if I was 20-30 years younger than most of the other members. I began building a visual framework for a business plan, an exciting creative endeavor guided by the Right-Brain Business Plan by Jennifer Lee. Again, I got brave. I made an appointment to share by business ideas with the executive director of the New Rockford Area Betterment Corporation.I was terrified, but knew I needed to take the step. And what a wonderful step it was. I not only left with encouragement, I left with a new friend and ally in my endeavors. With her encouragement, I started this blog. It was November 2012. Winter was on its way and my mind was to be far from my garden for sometime. But, I was able to awaken and nurture my writing skills and my long lost artistic interests and talents. By January, I began a project with the Dakota Prairie Regional Center for the Arts in establishing a space for artist consignment and retail. I managed the project and with a good group of dedicated volunteers. 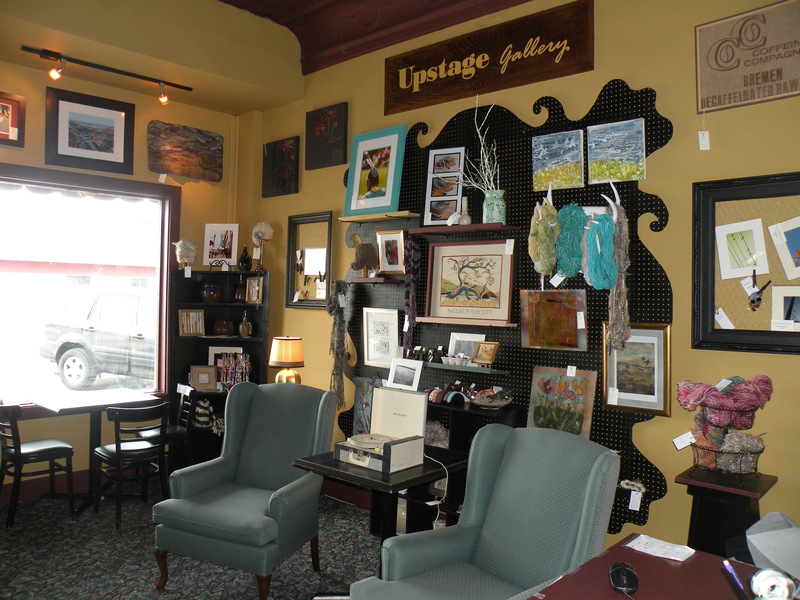 We opened the Upstage Gallery on April 5, 2013. In the meantime, I had gotten brave again. I wanted to build my larger networks. I planned to attend the Dakota Grown Conference. I asked if they’d like to have a blogger there to cover the event. When I arrived, I was greeted by familiar faces from years before. Hugs were given, along with updates on personal and professional projects. This was my third time attending the conference. But I was a different person than last time. I was no longer the Vice President of Land Grant Programs. I was Rachel Brazil, an independent professional. Being true to myself, I found that I’m likely to find others who understand and support my personal and professional journey. I was in awe. So many people had so many stories related to food, agriculture, and activism throughout the state. The local foods network in North Dakota is vibrant and vital, in so many ways. There are farmers and growers, producing food for the market. There are professionals in the non-profit and educational sectors with abundant resources. There are consumers, dedicated to building their own networks in which they can gain access to local foods. Many fall into more than one of these category, as they should. Because after all, we are all consumers. And we are all active through our daily and life choices. Where ever you might be in this network now, I encourage you to read the brief bios and summaries below, browse the links provided below. Share your goals in terms of your involvement with local foods, make contacts, and make steps to where you want to go. As for me, I’ll continue building my business as an independent consultant and grant writer, who also grows a big garden, raises chickens, and ducks, sells at the community farmers market, as well as draws, paints, and loves photography. Some day I’d like to expand, buy land, have goats and a couple pigs, have a green house and grow greens year around, and invite guests for a stay at a Bistro Farm Bed & Breakfast. Someday. But, how about you? Feel free to leave comments! The list below is by no means a definitive list. It is a overview of many of the people I met, talked to, or listened to at the 2013 Dakota Grown Farmers Market & Local Foods Conference. Additional information, resources, and grower information can be found through the North Dakota Farmers Market and Growers Association and the North Dakota Department of Agriculture Local Foods Initiative. Northern Plains Sustainable Ag- This grassroots educational organization helps Northern Plains farmers convert their farms to organic systems, increase the region’s land grant research in organic and sustainable agriculture, protect the integrity of the organic label, promote healthy trade relationships in the organic industry, and develop local food systems. Entrepreneurial Center for Horticulture- The Entrepreneurial Center for Horticulture is located at Dakota College at Bottineau and assists small to mid-size farmers and gardeners produce organic and specialty vegetables for sale. They provide technical assistance in marketing, business strategies and production for all types of vegetables. NDSU Extension Services- Within each county are extension personnel with the purpose to extend education to North Dakota residents of all ages and walks of life. They offer a special emphasis on strengthening agriculture and developing the potential of youth, adults and communities. Supplemental Nutrition Assistance Program- There is an increasing effort to make fresh local foods available to all people. A few farmers markets in North Dakota accept SNAP Benefits from their customers, but there is an opportunity for many more. Including assistance to cover the cost of the equipment. FARRMS- FARRMS was founded in 2000 to address specific educational needs of organic producers and processors and to promote sustainable rural development in the Medina community and beyond. FARRMS empowers people to dream and realize those dreams creating thriving, exciting, diverse, and sustainable rural communities. They establish links between people, good food, living farms and the environment through hands-on educational experiences. They model sustainability by acting with appreciation and respect for the environment, society, and just economics. FARRMS builds a better world through powerful, creative actions. North Star Farms Caprio, ND– Specializing in certified organic produce and community supported agriculture. North Star Farms is run by Marv and Ilene Baker who are both involved with the North Dakota Farmers Market and Growers Association and help begin the North Prairie Farmers Market in Minot. Riverbound Farms Mandan, ND– A certified organic vegetable farm south of Mandan that grows ten acres of more than 40 different crops. The farm is run by Brian and Angie McGinness. Brian spoke on a panel about getting specialty crops to market. Roving Donkey Farm Bismarck, ND– This small farm specializes in a variety of greens year around. It is run by Lori Martin, with the help of her three year old daughter. She spoke on a panel about building customer relationships. Morning Joy Farm Mercer, ND– Jon and Annie Carlson started Morning Joy Farms began in 2008, by growing and selling vegetables at a local farmers market. The next year, they began a vegetable CSA and continued to sell at the market. Pastured poultry and eggs were added to the CSA in 2010 and pastured turkeys in 2011. The demand for their pastured chicken, turkeys and eggs was so strong that the decision was made to devote the farm to grass-based meat production. In 2012, pastured pork and grass-fed lamb were added to the Morning Joy Farm product line. Garden Dwellers Farm, Esmond, ND– Holly and Barry Mawby grow and sell a variety of herbs. They also offer a variety of learning opportunities on their farm. There are many many more around, some have been operating for years. Others are just getting started. I encourage you to do what you can to build relationships with small scale farmers such as these listed above. Truly the best way to get involved in the local foods movement is to know your farmer and know your food. I certainly fall into this category, as do many of the people I listed above. There are others though too, at work on the ground and on the internet. They are building this movement from the ground up in their own communities. They are starting farmers markets in tiny towns. They are going to the state legislature with expressing their support for maintaining cow shares as a legal route to have access to raw milk. They are educating the public on food choices. They are creating food cooperatives. They are creating their stories everyday. They are making their own way by making food choices for themselves and their families that are sustainable and healthy. They each have a growing niche in this network that I am proud to be a part of. Posted in Cultivating the Soul, Gaining a Sense of Belonging, Recovering the Artist Within, Redefining Work and tagged business plans, courage, Farmers Market, food, joy, Local Foods, nature, north dakota, recovery, social networks. Bookmark the permalink. Always energized by gathering with like-minded folks! So nice to see you at the conference, Rachel! The Dakota Garden Expo took me away from this great group and I didn’t get to visit enough! Great to read your blog and “catch up” here! More power to you! Thank you Theresa! So glad these posts can be valuable to you. It seems there is never quite enough time for visiting and networking!